I remember the first readathon, and loving Dewey’s blog. It’s crazy to think that her little idea is now 10 years old, and she’s been gone for so long. What a legacy! I loved being part of that book blogging community. My blog has been quiet for too long so I’m participating in Dewey’s 24 Hour Readathon in an effort to get back into book blogging. Here’s my current TBR stack. I know there is no way I’ll get through all this during the Readathon, but I figured I need some options. Hunting Houses by Fanny Britt — I’ve been slowly making my way through this ARC. I don’t think the cover copy does it justice as it’s so much more than a woman questioning her marriage. I’m aiming to finish off the last few chapters during Readathon. Norma by Sofi Oksanen — I just received this copy for review. I was a little worried about the initial premise due to the death of a parent, but I’ve gotten into the first couple chapters and it’s hooked me so far. 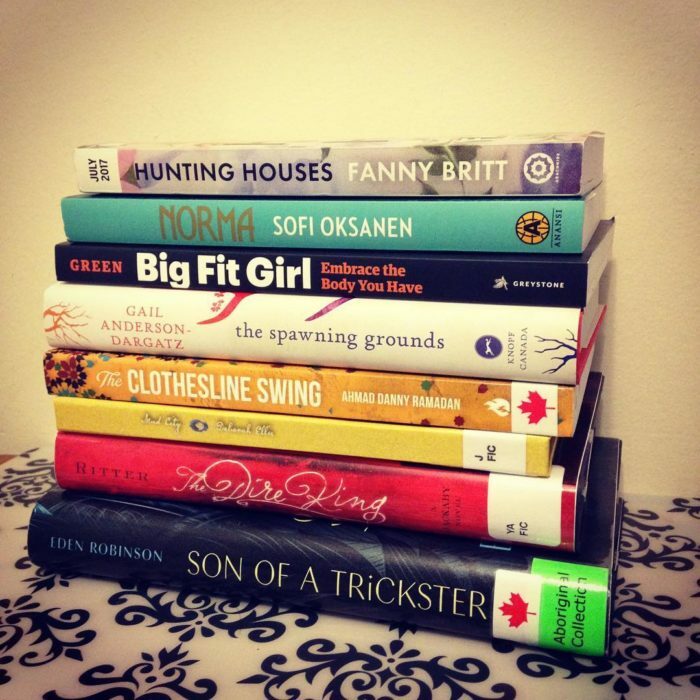 Big Fit Girl by Louise Green — the only nonfiction in the stack. I bought this at Word Vancouver at the end of September and really appreciate the author’s stance on health and fitness and body positivity. The Spawning Grounds by Gail Anderson-Dargatz — I just received this copy for review. Haven’t started it yet but it’s got a lot of accolades already. The Clothesline Swing by Ahmed Danny Ramadan — A library hold that came in at a very awkward time, since I have so many other books on the roster at the moment. The author is a local activist for LGBTQ+ refugees and I heard him read back in May. Mud City by Deborah Ellis — this is book three in the Breadwinner series. I’ve been ploughing through these middle grade books because I’m going to see the animated feature film based on the book later this week. The Dire King by William Ritter — the latest book (#4) in the Jackaby series. Imagine if Sherlock Holmes was crossed with The Doctor and you’ll get Jackaby. It’s a young adult book that is good for middle grade readers who want to read up as the content is clean and not gory. Son of a Trickster by Eden Robinson — another library hold that came in with awkward timing, but I’ve already read the first 50 pages or so and I’m hooked. Not pictured: Dr. Edith Vane and the Hares of Crawley Hall by Suzette Mayr, which I’ve got an advanced reading copy on NetGalley. I don’t have an ereader or tablet so I read on my phone. I just started Son of a Trickster and I’m loving it so far. We baked oatmeal cookies on Thursday night, so I’ve got oatmeal raisin cookies with a dash of cinnamon… and I might also steal from the boy’s oatmeal chocolate chip stash. Always paired with a cup of tea. I’ve been blogging since 2001 but have been pretty quiet on the blog since doing two post-secondary degrees back-to-back (2011-2016). I didn’t participate last year, but I have participated previously. As I said, this is a concerted effort to get back into book blogging. Although in previous years the balancing of reading with socializing is always a difficult one. 1:30 pm PST: Weekends are for sleeping — wisdom of Monnibo. Starting out my day late with some brunch and Readathon planning. Will probably catch up on social media and shower and such before beginning a book. 5:00 pm PST: I’ve just finished Hunting Houses by Fanny Britt. I started it months ago and I’ve just been reading bits here and there, enjoying the prose and suspense. Finished the last 50-ish pages. New Paragraph: Jared used Kyle’s beer bottle to make the guys one last batch of crows. Mel gave him a cage and Kyle gave him a pair of spikes. Saul danced him as if it was a quiet cook and the guys started tripping their friends to have one last bag before their finances forced them to sleep. Jared watched the fly coming north, sipping a wire while they dyed their way through the crows. Their brightly partiers sparking as they banged the door open. 1. What are you reading right now? Just finished Hunting Houses. About to start Mud City (book 3 of the Breadwinner trilogy). 2. How many books have you read so far? Only finished Hunting Houses, which was already partially read. 3. What book are you most looking forward to for the second half of the Read-a-thon? Clothesline Swing if I can get to it Ahmed Danny Ramadan is a local author and activist for queer refugees. 5. What surprises you most about the Read-a-thon, so far? How much it’s grown and Dewey’s legacy. 12:30 am PST: I just finished Mud City by Deborah Ellis, the third book in the Breadwinner series. It’s a short middle grade novel, so it should have been a quick read. But other plans (and adulting things like dinner and groceries) often get in the way. Going to head to bed soon and read Son of a Trickster or Norma until I fall asleep.